Post-Christmas.. Post. #SWTOR #Christmas – Nomadic Gamers, eh! My Operative managed to obtain her first space ship last night as I sailed into level 17. This means I also earned a second companion, one I can send out on crafting missions without having to sacrifice my safety. 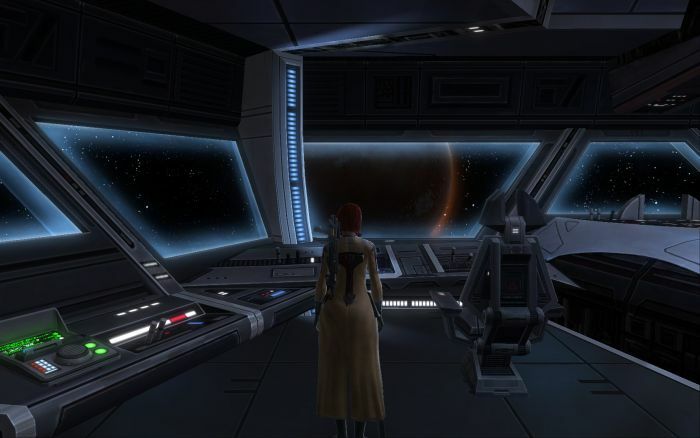 I actually enjoy crafting in SWTOR, even though it’s not very hands on and can take a lot of time if you haven’t earned standing with your crew members. Santa was very good to me this year. I got a new video card, a Radeon HD 6950, which replaces the two crossfired 4850’s that I was using. There was nothing technically wrong with the cards, I’ve been able to game just fine – but they were INCREDIBLY loud. It felt like a jet was flying overhead any time I started up a game. This new card is a dream, silent, and powerful. I used to use Nvidia cards, but one year I burned through three of them so I switched over and haven’t looked back. I moved all of the settings up to high quality and it runs very well. I’m still playing WoW despite the lack of posts lately. I’m doing the Twilight dungeons, and this week I won three pieces of gear from the LFRaid tool on my shaman. She had not won a single thing before now, so I’m quite pleased. I have been taking a small break from leveling up the druid, I was a bit burnt out after getting her to level 70. I’m sure I’ll get back to leveling her once the holidays have calmed down. I hope everyone had a fantastic Christmas, filled with lots of loved ones. As always, happy gaming. No matter where you find yourself.